This article is from the July/Aug. 1994 AFRMA Rat & Mouse Tales news-magazine. TThe best words to describe Keeneau are, father, friend, doctor, and keeper of all. 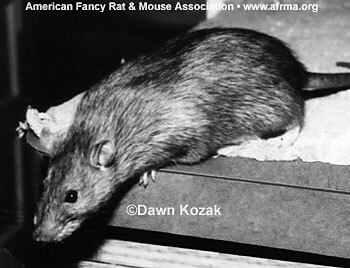 Keeneau is a male agouti rat. A very close friend of mine. Keeneau has now reached the age of 2 years and 8 months old. He’s still as alert as ever. He can still snag a cookie from your hands as fast as you can offer it. You wouldn’t think that Keeneau was the oldest rat that I have. The oldest that I’ve ever had in a rat. Keeneau was and is the best father rat I’ve ever seen. He’d play with his kids, let them tramp all over him. He was so gentle. Is so gentle. After weaning Eliphas’s kids, I noticed that Eli had a swollen eye. After a couple of vets, I found one that diagnosed her with glaucoma. Eliphas had to have her eye removed. It was so hard to see her with that collar on. She wore it for almost 5–6 weeks. She insisted on always ripping her eye back open. She lost a lot of weight, she couldn’t eat so well with that collar on. I would peel sunflower seeds for her to eat. A very tedious job! It wasn’t until 5 weeks later that I decided to put Keeneau in with her. I was so afraid she’d be teased or that someone would gnaw at her eye. Well, thanks to “Doctor Keeneau,” Eliphas healed real quick. Keeneau cleaned her eye carefully every day. I watched him peel sunflower seeds for her. She would sleep, and Keeneau would just watch her. As if to make sure she was okay so that he could sleep. It didn’t take long before she recovered completely, and she and Keeneau were returned to the rest of the rat population. At one point in time Keeneau developed a weird infection in his right rear leg. It swelled up like a balloon. The vet told me that it was a staph infection. He was put on Amoxi Drops. The infection didn’t seem to get any better. It spread in fact. Now his other back leg was a little swollen. He couldn’t use either leg. I would cry as he would drag himself across the floor for a little attention. I called the vet and told him of this new development. He said that it sounded like Keeneau had a stroke, and that the best thing I could do for him was to put him to rest. I was devastated by that. I knew that I couldn’t do that. But what was right? What was more humane. At this point the swelling was down, but Keeneau still couldn’t use his back legs. So I believed the vet. I made a tentative appointment to take Keeneau in. That night a friend of mine came over. Keeneau happened to be his favorite rat of all my rats. We sat on the floor and gave Keeneau all the attention he could ever want. He would drag himself from me to my friend and back again. He ate his cookie. My friend then insisted that I cancel the appointment. He told me to let nature take its course, just wait this out. I took his advice. Thank the Lord that I did. In less than two weeks, Keeneau was back to himself. Not even a limp. Keeneau wasn’t ready to go. He had work that still had to be done. Keeneau was always the first one to let me know if someone was ill. He’d draw attention to himself and to the patient. He also made sure to stay with the patient until they were better. He watched over and took care of all his children and cagemates. Keeneau is now taking care of his last remaining son. I’m hoping that when his job is done Keeneau won’t think that he can rest. He’s still got me to take care of. I know that’s unrealistic. Keeneau will be the last of my originals. I’m not ready to part with him yet. I wasn’t ready to part with any of them. Keeneau and Adonis are getting the most special care and attention. They always did. But even more so now. Here’s to a long, long, life boys!! Mercury was a very special little animal. Friendly from the start and needing no training or socialization, Mercury won the hearts of every person and animal alike. Her most endearing trait was the way she loved to give “kisses.” Anyone who stuck their hand in her cage would get blanketed with licks, then she would climb up their arm to perch on their shoulder and go for the rides she loved most of all. She also loved to “lip-kiss.” Her tongue was always so soft. A neighbor of ours hated rats. She thought they were all disease-ridden creatures up to no good—until she met Mercury. She was reluctant at first, when I placed the cute little white fur ball in her open hand, but, with Mercury, charm was a natural and, with love and kisses, even that reluctant neighbor broke down and admitted how sweet and special, at least this particular rat was. Every year my family would drive to Virginia to visit my grandmother, who is also a devout animal person. That first summer Mercury was with us we decided to take her along. I packed her cage in the car with plenty of fresh food and water and we were on our way. Mercury loved the drive. She sat on my shoulder and gazed out the window at the scenery whooshing past her with an amazement only a rat can understand. I had taught Mercury how to walk on a leash, so, at rest stops, I would take her for a walk in the warm summer grass. The stares I received from people! I can only imagine what they must have been thinking. Mercury loved all other animals. I had cats as well and Mercury took great pride in climbing on their heads and teasing them with her wit. The cats must have sensed how special she was because they never bothered her or tried to hurt her. They just sat there and let her use them as a mountain to climb. Mercury spent three Christmases with me. During each one she would receive her own little rat gifts—usually chew toys or treats, and she loved them all. However, as the cliche goes; “all good things must come to an end,” unfortunately held true here as well. One day, Mercury developed a lump on the side of her mouth. It grew very quickly and eventually began to interfere with her eating. She tried so hard to kiss my hand, but it became increasingly difficult for her. I took her to the veterinarian several times, and they finally decided to try and remove it. They warned me of the dangers surgery would pose as she was so old. That day they performed the surgery and I got a call from the vet when it was done. He told me they wanted to keep her there for the day to watch her. Shortly after that call, I received another one. Mercury did not wake after the surgery. She died in her sleep. I cried for weeks after that. My mother cried with me. We all loved Mercury so much. Her loss had a tremendous impact. To this day, thirteen years later, I still get a lump in my throat and tears in my eyes when I think of that dreaded phone call. I’ve since owned many, many rats. I’ve bred and raised hundreds in an attempt to produce another kissing, loving rat like Mercury, but have had no luck. There have been others, special in their own way and I loved them, too, but none will ever take that special place in my heart that I will forever hold for my Mercury. Dusty was a wonderful rat. I loved him when he was born and to the day he died. I was there when he was born to Arthur George McArthur and Dandy Georgia McArthur. I was wanting to call him Inky, but by some default, he was tan. Which is kind of hard to realize, since his dad was a Hooded rat and his mom was a dark brown. He was the only one born from the litter, because his mom was too old to have babies. But I still loved him. He was an inch and a half, when normally babies are only an inch. I used to tease him about being big. Everybody claimed he was a sewer rat. He was 20 inches when he turned 1. Little did I know, the reason why he was so big was that he had a birth defect. He was unable to breathe, and so his lungs became larger, increasing his size. I thought he had a deviated septum. He acted like a normal rat; he played with his father and had dominance wars. Except for a little bit of hoofing and noise making, he was a normal rat. Then he got a blister that looked like a blood blister. I just thought it was a scratch that had gotten infected. It continued to increase in size along with my worry. One day, when I was at school, my mom decided to take him to the vet. Just a regular vet, nothing fancy. The vet claimed it was a tumor, and it would need to be surgically removed. He put a little anesthesia on Dusty, but not enough to knock him out. Dusty blew a bubble of blood and died. The vet said Dusty had had a lung cancer all his life. So if your rat is ever making noise when he breathes, take him to the vet immediately. Or if he is oversized, it could mean he has cancer. I learned the hard way.